Fort Union National Monument is located near Watrous, New Mexico. Fort Union has been granted a national monument status in 1954, to be preserved for future generations. This historical site presents the second of three forts, which were built in this place in 1851. Tourists can also see the ruins of the third fort. Fort Union was built in 1851 as a building to protect the road to Santa Fe. Three different forts were built to be near one another and to protect the important route. Fort Union was the largest fort in the territory of the American southwest and acted as a military garrison and a military depot. The road to Santa Fe was especially important because they passed Mexican and American merchants to carry various goods from Missouri, and to bring goods from Santa Fe. 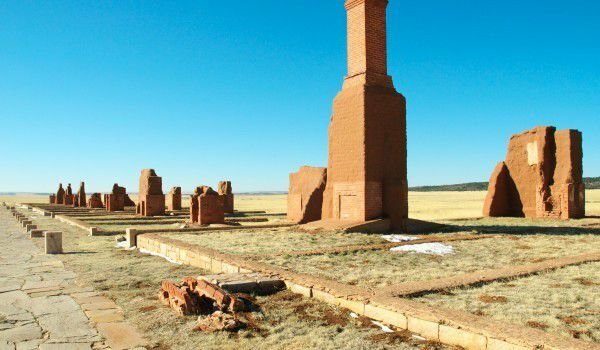 Fort Union was not only a guarding point on the way to Santa Fe, it was a symbol of national power. Fort Union performed not only military but also logistics functions. Fort Union patrols guarded the road to Santa Fe. The Fort also provide escorts, who accompanied the passengers to postal stations. Beginning of the Civil War begun a continuous stream of people on the way to Santa Fe. Confederate troops intended to occupy the western part of the road, and the Colorado gold fields. At that time, the Fort served to store food and ammunition. They are distributed by special orders. After the railroad began to operate to the west, the way the supply provisions became even easier. Thus, provisions and ammunition reached more quickly to the posts. In 1879 the track passing Fort Union and gradually stopped functioning as a depot - it happened in 1883. Without people who care for supplies for the animals and everything else, you can not have a post there. After forty years of service as a front line post, Fort Union had to be defended in the courtroom. When in 1851 Fort Union was built, the soldiers could not intrude without anyone seeing them in private ownership, which was part of the Mora Grant. The very next year, Colonel Edwin Sumner announced the fort was a military reserve. In court battles started to get hot on Fort Union to be recognized as part of the Mora Grant. In 1876 it was decided that Fort Union is located within the Mora Grant. But the army did not want to move elsewhere, but also did not want to pay the land owners. Once it became clear that the Army has made improvements in the area and could not withdraw without receiving compensation, the agreement was reached that the army remained in the fort until 1891.